Look at the photos and the title of the text. Does your school have a website? Have you ever uploaded any of your school work? Read the first paragraph. What are the new developments in Moscow schools? Read through to find out. In the 21st century, it is nearly impossible to stay invisible. The rapid growth of the Internet and other information technologies enables organisations like the Department of education in Moscow to considerably open themselves to society. This way, everyone, from students to parents, can enhance their abilities. In that context, Moscow’s education system embraces the principle of openness and transparency, which is written into Russia’s Federal Law on Education, and leads the way in educational development. Across the city schools found and actively develop useful information resources and online services. These offer various pieces of information ranging from local events and projects A) ... . Every school in the capital has its own website which was created using a template from an information portal. Many of these websites are listed as some of the best school websites in Russia. They allow schools to post information about their achievements B) ..... .
With all of Moscow schools now on the web, the lives of parents have changed significantly. Where once parents had to attend meetings at the school, now regular meetings between parents and teachers can occur online. 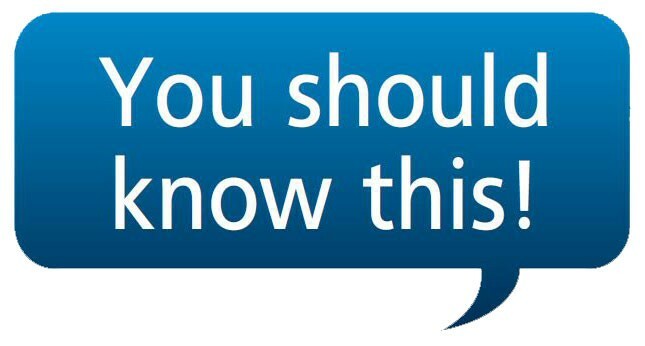 Parents can ask questions to any member of the staff C) ..... .
Parents can now take a more active role in the running of their local schools. For instance, the specialist knowledge of parents, D) ..... , can go toward creating new courses which can teach students important vocational and professional skills through workshops, competitions and festivals. Some of Moscow schools are even opening their own TV studios. These help students develop their skills as reporters, hosts, editors, technicians and photographers E) ..... . They can also prepare reports about important events in their daily life at school. What is more, many of the interviews, essays, documentaries, cartoons and music clips created by pupils are also broadcast on Internet TV channels – such as “Moscow Educational,” F) ..... . By doing this, students can develop important life-long skills such as creativity and the ability to communicate with others. We don’t know yet how Moscow’s education system will change education across Russia. Schools are now on the web, TV studios are now educating young reporters of the future and pupils can now post frank stories about their school life in blogs and on social networks. What is clear, however, is that the future of Moscow schools has never looked brighter. Read the text and complete the gaps A-F with the parts of the sentences marked by numbers 1-7. One part is extra. Listen to and read the text again. What do you think about parental involvement in the educational processes? Should parents assist education? In what ways? How do you think the Internet can enable you to study better? To answer this question, go to My Moscow Extra! You may work in groups. You will have to do some additional Web search. Compare your findings with your partners’ results. Look at the title of the text and the photo. What do you think the article will be about? Discuss with your partner. Have you ever been to a Panda park? What do you know about Panda parks? What would you like to learn about these special parks? Make notes. Read the text and see if your questions were answered. A When spring comes, why not to try something more extreme than playing badminton or tennis — like a panda park? Panda parks, or Thai parks, are the popular types of active rest for kids and adults in Russia. You can find them almost in every city! Moscow is no exception. They usually consist of dozens of stations, situated 3-4 metres above the ground. You need all your climbing skills, sense of balance and trust in your teammates to get through the park. B Usage of Thai parks for entertainment is a modern invention. Similar ones were used in Ancient Greece to train soldiers. There was no common name for them for a long time in Russia. They were called rope parks, sky parks or Panda parks. Today, however, they’re a great opportunity to feel yourself like Tarzan as if you climb tall trees and hang on lianas. But unlike Tarzan you have equipment, different challenges to complete and no wild animals to fear! C Stations at Thai parks differ as you climb up, come down and go from tree to tree. The basic routes have 8-15 stations and you may need 15-60 minutes to go through all of them. These routes can include everything: climbing walls, rope ladders or even zip-lines. There are also many different levels of complexity, thus beginners and professionals will have a good time. D Many stations in Panda parks will test your whole body. Some of the stations require speed and strength, while others require precision and balance. The climbing wall, where you deal with gravity, will test your strength as you lift yourself up using only your arms and legs. The rope-ladders and bridges will test your climbing skills and sense of balance. 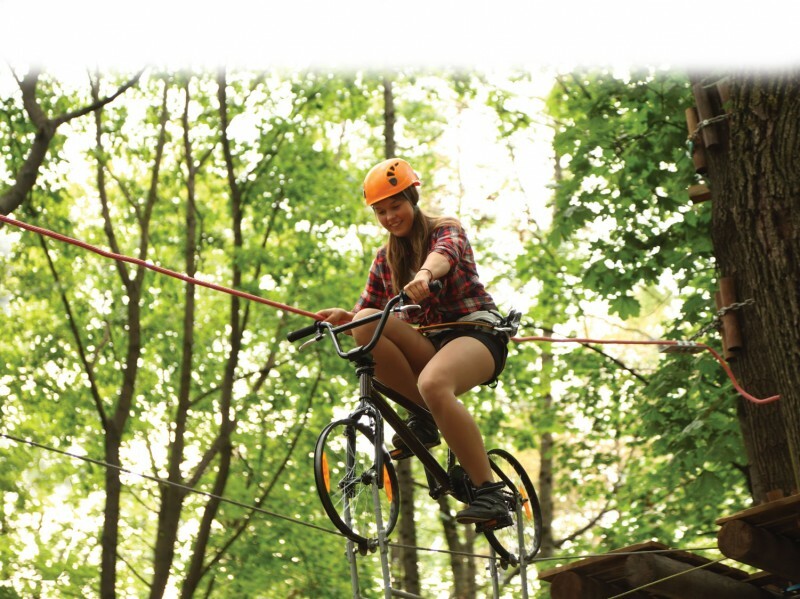 The zip-lines make you overcome your fear of height as you swing through the air. There is a station for everyone! E Thai parks are great places to develop relationships, improve your confidence and unite your team. That’s why they’re one of the most popular places, Russian companies attend for team building. The team always wins in Thai park, not an individual. Everybody should work together, by communicating, trusting and listening to each other to win. While conquering the course, people show their worth, overcome fears and, finally, become acquainted with their colleagues. F The first thing the visitors see in panda parks are the ropes, logs and nets. Before setting off you must make sure that the clothes you are wearing are appropriate for sports, and that you have learned the safety information. Many parks offer test routes to try before you will be allowed to go to the main route. Before the challenge begins, an instructor hooks a safety lanyard to your belt and you’re ready to go. Remember you mustn’t take it off during your attempt! G There are also some rules for visitors in Thai parks. Children under the age of 10 and who are less than 1.40 m tall must be accompanied by an adult. Parks are usually closed if the wind speed is more than 10 m/s and it’s not allowed to go through the route if you feel sick. During your visit, you may get a few bruises or stains on your clothes, but you won’t certainly regret visiting panda park, and of course you can come again whenever you want! Match texts A-G with headings 1-8. Each number can only be used once. There is one extra heading. Which activities can you do in a Panda park? Which of these activities require strength/balance/speed/precision? Which are the most challenging activities? Have you ever tried any kind of these activities? Was it fun/dangerous/demanding? Tell the class about your experience. Listen to and read the text. In three minutes write the most interesting things you have learned from the text about Panda parks. Tell the class. Read the first paragraph. What do you think the story will be about? Discuss with your partner. Everyone loves travelling. Most people usually choose magnificent and comfortable places where you can relax. However, some people prefer difficult challenges to test their limits, experience new emotions and get inspired. I belong to the second category. On 10th April, I landed in the base camp Barneo with my group. We were children from orphanages from Nizhny Tagil, Kirov Oblast, Kemerovo Oblast, Voronezh Oblast and Khanty-Mansi Autonomous Okrug. There was a girl from Moscow and another teenager from Surgut who were using their hands to communicate – they were hear-impaired. All of us had been through difficult situations but a unique expedition was waiting for us. Famous traveller, two times Guiness world record holder Matvey Shparo headed the expedition. A helicopter took us to the starting point - 110 km away from the North Pole. It was a wisely chosen spot. The ice-drift there would bring us closer to the Pole. 18 hours later we set off skiing according to the route. Things didn’t go as planned. One of us had forgotten something really important: the necessary food to survive the extreme weather conditions - lard, honey and lemons. We had been lucky to find these products in Murmansk. We had one more obstacle to overcome. A girl had left some ski equipment back in the helicopter. So, as members of the same team we had to share our things so that we could all make it. The first camp was set up at 4 am Moscow time and it was -32 °C outside. Despite the difficulties, we managed to cover 25-27 km per day. It took us about three days to get accustomed to the conditions and learn the basics. 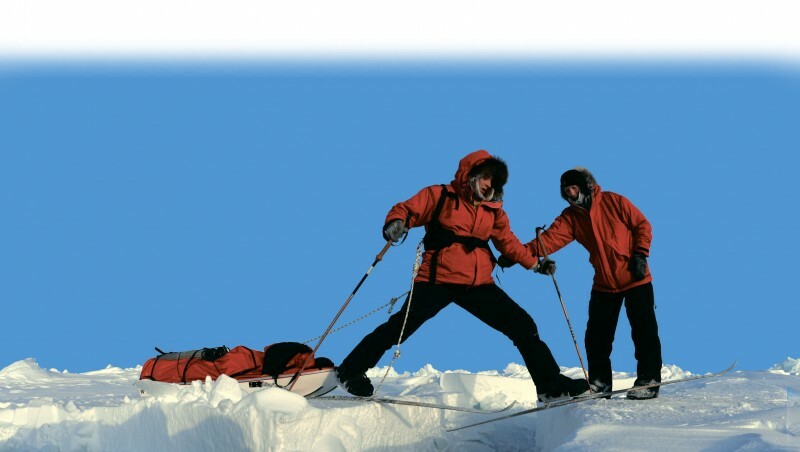 Every day we chose our leader to find the best way among the huge ice hummocks consulting our GPS-navigator and taking into account the team’s pace. The next day we came across a huge ice-hole. “It must be 100 metres wide,” said a boy. “We have to cross it,” I said. It took us nearly four hours to swim across the hole using our diving suits. Eventually, our efforts succeeded. After skiing for several days, we were exhausted. The cold was taking its toll. To top it off, one of the hear-impaired children got frostbite on his hands so the other one became his “hands” to help him communicate. We were getting closer and closer to the North Pole. When we looked at the GPS, we realised we were only a few metres away from our goal. At that moment, we started running towards the Pole and counting down the remaining meters on the navigator’s screen. At 12:44 on 18th April, 2014 our great achievement compensated for all the struggle. We had reached the North Pole. It was such a rewarding experience that we couldn’t hide our joy. I have to admit it was a transforming experience. It has changed my outlook on life. It gives the participants the opportunity to develop life skills such as responsibility and trust. It is an experience with high educational value for every teenager. Read the text and answer the questions in your own words. 1 What type of travelling does the writer prefer? 2 Who was the writer travelling with? 3 What is special about the starting point they chose? 4 Who was the leader of the group and what were the responsibilities? 5 How many days did the group spend to achieve their goal? 6 What kind of problems did they have to face? How did they manage to solve them? 7 What does this experience mean to the writer? Imagine you are one member of the group in the text and today it is 19th April, 2014. 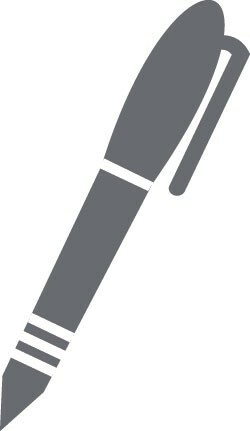 Write a diary entry to narrate your recent experience. Write about what you achieved and how you feel. Look at the picture. Describe it. How often do you visit shopping malls? What can you do there? What are your favourite activities? Discuss with your partner. Read the text. Form derivatives from the words written in capital letters at the end of the lines and marked by numbers 1-6 to make them match the contents of the text grammatically and lexically. Complete the gaps with the transformed words. Each gap corresponds with a separate task from group 1-6. Once a famous lady said: “I never go shopping to GUM, I go there for impressions.” There is truth in these words. 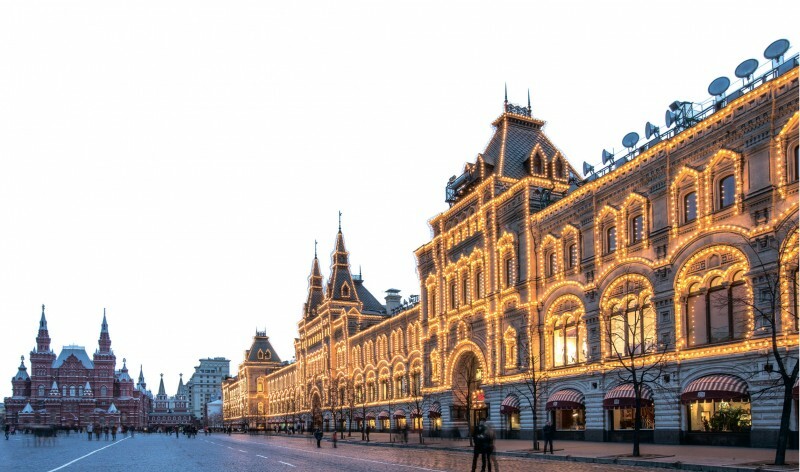 Not only can you shop in Moscow’s GUM – you can enjoy a stroll or daydream while sipping coffee in one of the numerous cafés. The history of GUM is 1) (DRAMA), just like the history of Russia. Stop, look around and you will see history hiding around every corner. If you want to see the real GUM, you should enter the building from the Red Square side. The façade here looks like an elegant tower. It was created by the architect Alexander Pomerantsev in his project of 2) (CONSTRUCT) of the Upper Trading Rows. This enormous building, modern for its time, was designed in the neo-Russian style with pre-Petrine architecture features. Emperor Alexander III personally approved of the project. The huge Zhirardov Manufactories shop took up several halls in the Upper Trading Rows. It was an enormous textile factory, famous for the excellent quality of its linen and sheet cloth. In 1870, the factory even got the right to print the 3) (NATION) emblem on its goods. From dowry sets for 15 thousand roubles to silk handkerchiefs for 6 roubles per dozen, the variety of products it made was exorbitant. On the first floor of line 1, in the drapery department “Tissue” (now BOSCO and BOSCO BAR) there was the 4) (LEGEND) Section 200. The entrance was from Red Square. There wasn’t any sign and there was always a policeman guarding the door. All the goods were brought to Section 200 from the warehouses of the GUM. However, from the 1970s goods from abroad were also brought into the section. So, along with typical soviet “cult” things – mohair scarves, sheepskin coats and briefcases – Section 200 started to have such treasures like Nina Ricci dresses, French cosmetics and Italian shoes. Soon it turned into a "courtier" shop of the Kremlin and a 5) (SUPPLY) of the Politburo. After the collapse of the Soviet Union Section 200 ceased to exist. Up to 1917 there was a candy shop called Abrikosovs at the end of the Upper Trading Rows. According to various sources, its owners controlled half of the confectionery market in Russia in the 1880s and 1890s. In 1889 the Abrikosovs received the 6) (HONOR) title: “Supplier of his Imperial Majesty.” The Abrikosovs had five other shops in Moscow, but the main shop was in GUM. Here, one could buy sweets in gift boxes made of glass with silver plates covered with velvet and silk. The Abrikosovs also built Moscow Conservatory, Moscow psychiatric hospital and the Maternity hospital in Miusskaya Square, to name a few. Work in groups. Collect more information about GUM in Red Square and produce a leaflet for tourists informing them about that department store. Write about the activities you can do there and the goods you can buy. You can include special facts about it. Download photos to illustrate your leaflet. How do you usually feel before an exam? What helps you deal with stressful situations? Which are the most useful tips? Listen and read to find out. Keep in mind that exams are just like any other daunting tasks. They are sure to have somekind of solutions. When you think that you haven’t worked hard enough and will perform worse than others, remember, 80% of other students think the same. Being nervous before the exam is normal. When you are really stressed, try to imagine a place where you feel comfortable, calm and safe. For example, a cosy warm house, a seashore or anything else that works for you. Picturing that place in your mind will help you deal with anxiety before and during the exam. Sometimes it is helpful to contact those who have already passed the exam. Try to focus on the facts – procedure, contents of the tasks, etc. Remember that different people experience different feelings. After the exam, you will have your own experience to share. Don’t change your lifestyle dramatically before the exam. Habitual actions and familiar surroundings will help you focus on achieving a specific goal – passing the exam successfully. Don’t overuse strong tea, coffee, etc. – your nervous system might not endure that. Sleep well before the exam. A sleepless night before the exam definitely won’t help you. Don’t forget your passport and a black gel pen. In most cases an exam is seen as something alien, made up by adults as a punishment. In addition, it might make you feel powerless, helpless and angry. However, that is NOT true. Try to see it as a cool upgrade of your abilities and opportunities, a shift to a new level of life. take away from the classroom: drafts, exam papers or photocopies of them, writing utensils, notes, etc. If you break any of the above rules, the organisers have the right to remove you from the classroom. Your exam results will be voided. Read the text again and decide if the statements are T (true) or F (false). 1 Drink lots of energy drinks before every exam. 2 Always get a good night sleep before the exam. 3 The organisers will fill in the registration fields for you. 4 You are allowed to leave the classroom during the exam. 5 Talking to others in the exam is prohibited. 6 You are not allowed to bring your phone into the classroom. ​Listen to and read the text again. Make notes to give a short talk to students to help them deal with exam stress.